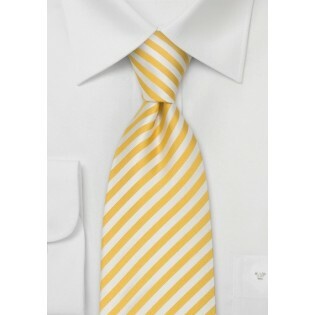 Add color and life to your same-old gray suit and white shirt look with this vanilla and sunflower striped yellow necktie. This tie is ideal for the man looking to update his summer business look. 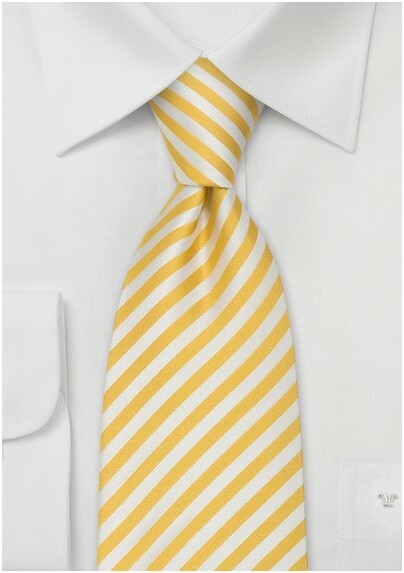 This tie is also one of our popular yellow ties chosen to outfit groom and groomsmen. To match this tie is quite simple. Although a black shirt will add a trendy touch to this tie, we prefer to showcase this beautiful yellow tie with a classic white shirt and navy blue suit. Handmade from pure silk by designer Parsley.